Before beginning the drive, Mitt Romney put Seamus, the family’s hulking Irish setter, in a dog carrier and attached it to the station wagon’s roof rack. He’d built a windshield for the carrier, to make the ride more comfortable for the dog. As the oldest son, Tagg Romney commandeered the way-back of the wagon, keeping his eyes fixed out the rear window, where he glimpsed the first sign of trouble. ”Dad!” he yelled. ”Gross!” A brown liquid was dripping down the back window, payback from an Irish setter who’d been riding on the roof in the wind for hours. 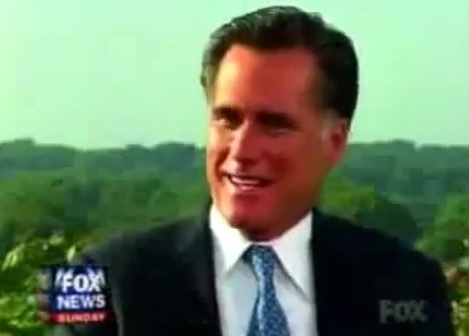 The ad, entitled “For The Dogs,” is ostensibly pegged to the idea that Romney is unfit to debate President Obama, but that’s really just a fig leaf to exploit comical Romney moments like his recent “I like to fire people” gaffe (taken unfairly out of context), his comical rundown of his history of “varmint” hunting, or his impromptu performance of Who Let The Dogs Out? For a candidate who has tried to draw a distinction between “going negative” and drawing legitimate contrasts, this is an exceedingly cheap exercise.